Next Step: That's My Bag! During my last work trip, my carry-on suitcase went kaput. On the way to the airport (or rather, on the way to grab a taxi to the airport), one of the wheels got stuck and I chalked it up to a piece of ice on the sidewalk getting lodged in. Upon closer inspection I saw that the wheel was warped, preventing it from spinning. Pulling a heavy suitcase with one working wheel was less than fun the rest of the trip. The search for a new carry-on was on. I loved the look of colorful hardback cases - just the right amount of mod, and they are so light! Actually opening up the ones I found at Target and Macy's though left me wanting more. At least the ones in my price range. No real pockets, maybe a mesh divider: would I be able to separate my shoes from my clothes? And the ones at Target already looked scuffed up - what would one journey through baggage claim do to it? The Samsonite xSpace 21" Carry On Spinner. Why is it called a spinner? You can twirl this bad boy around and the quad wheel action takes the verbs "pull" and "drag" out of toting your suitcase. All you have to do is walk and it walks alongside you. I just got home from our first trip together and it definitely made the long trek at the airport to my faraway gate a little better. In addition to a deep main area, there is one side pocket (comes with an extra bag for dirty laundry and a plastic 3-1-1 case), 2 front pockets and 2 more inside pockets. It also expands if needed, though keep in mind this would cause it to not fit in the size tester at security and you may have to check. Did I mention 50% off with an extra 20% off as part of my Macy's card rewards program? That gave me a total savings of $207 over the original price of $360.Whoa. Now just imagine if I didn't have to factor in the 10% sales tax us Cook Countyers get to deal with! You may be thinking - boring black suitcase, eh? Well, I was hoping for a little color but there were limited options at the store I was at. 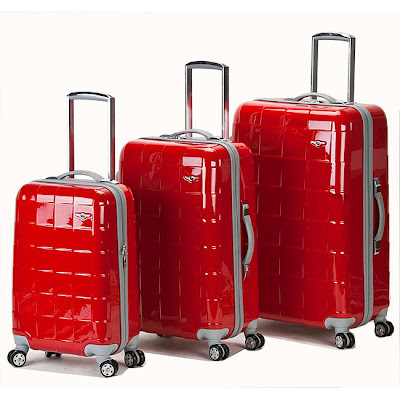 Looking now at samsonite.com, the red one is beckoning me. . . If I didn't need the suitcase for a flight the next day, I may have been more patient. Since this is a carry-on bag, hopefully it is not leaving my side, but if it does I want to be sure to be able to distinguish it from all the other black suitcases moving down the baggage carousel. My sister bought me a luggage ID handle a few years ago as a gift and it has been great! It velcros on the handle and also has space inside for a business card/address label. I can spot this thing a mile away when it is coming down the pike. I also have a regular luggage tag that quickly identifies my name and I throw another name/phone number/address indicator in the inside of the luggage in case the outside tag gets ripped off. I have been pretty lucky so far with my luggage - it has only not come back with me twice, both times I got it the next day. Of course, I had to learn the hard way to pack my contact solution and glasses in my carry on bag/purse. That was a rough night for my eyes. I think I'll save some smart packing tips for a later post - I will do anything to avoid checking luggage nowadays, so I get creative with what I bring and how I pack. PS. I wrote most of this post in some hotel downtime during my work trip to Ft. Lauderdale this week. . . okay, Chicago, time to step up and bring on the nice weather or I may threaten to leave you! i have a samsonite red spinner carry on and it's fantastic!!! so easy to spot and i will never go back to non-spinner luggage. i found mine at kohl's for $39 (my sister and i still believe they grossly mis-priced it's sale as it was originally around $250). i'd like to further clarify that while i only paid $39, karma came back to bite me when booking a flight a few weeks later. i booked the same flight as my friends a few hours later and it was $50 or so more expensive. Nancy, I'm going to take this thing back to macy's, show them your post and demand the same price match :-) That's an awesome deal!